The September quarter was a terrible one for risk assets. 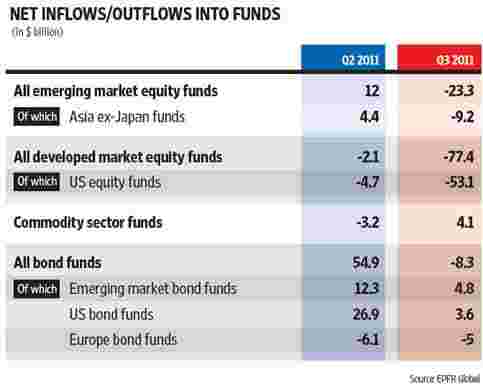 As the chart shows, funds moved out dramatically from equities—both from developed and emerging markets. The MSCI World index fell by 17.1% during the quarter, while the MSCI Emerging Markets index fell much more, by 23.2%. Bond funds, too, were not spared and inflows into them were much lower. Also, as EPFR Global points out, for emerging market bonds, “the last week of September saw a record setting outflow of $3.19 billion as rising risk aversion hit home". On the other hand, the final week of September saw US bond funds chalk up their biggest weekly inflow on record.